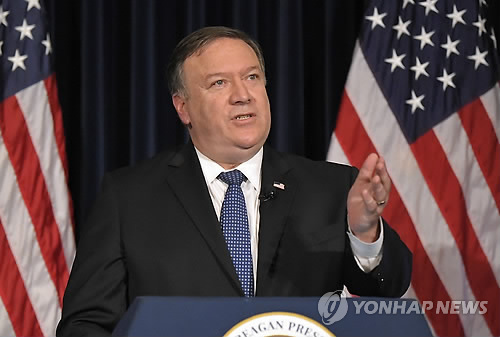 WASHINGTON, July 25 (Yonhap) — U.S. Secretary of State Mike Pompeo has voiced hope that North Korean leader Kim Jong-un will deliver on his promise to dismantle the regime’s nuclear weapons program. Pompeo was speaking in an interview with the Australian Broadcast Corporation Tuesday amid reports that North Korea has begun taking down facilities at a key missile testing site. Kim agreed at his summit with U.S. President Donald Trump last month to work toward the “complete denuclearization” of the Korean Peninsula in exchange for security guarantees from the U.S.
Progress has reportedly been slow to implement the deal amid U.S. intelligence agencies’ assessment that North Korea continues to expand its nuclear facilities. Pompeo said the two sides will continue to negotiate. “We will try to find the right path forward, but I’m confident that that is the world’s expectation and I’m very hopeful we can deliver on Chairman Kim’s commitment,” he said. And until North Korea denuclearizes, sanctions on the country will remain in place, he said.